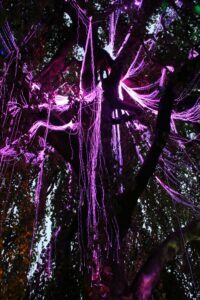 Charles Audley from Baseline Productions contacted us to discuss decorating a weeping birch tree on site at a charity festival. We are happy to of been part of this project. Custom fibre optics supplied 2 custom made harnesses using sparkle fibre optics. Sparkle fibre is a side glow type of optical fibre which also has added cracks throughout its length, this is to allow light to leak through creating some spots brighter than others which gives an amazing shimmering effect. This fibre in question has 3 x 0.75mm fibres together in a clear PVC. 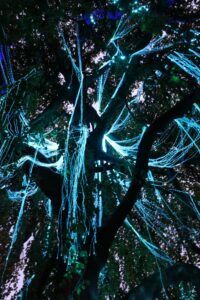 To create this project, altogether there was a staggering 10,800m of optical fibre used. We were given some details about the tree, its height and roughly how many main branches there was. We agreed that 2 harnesses of 300 x 6m lengths of sparkle fibre would be enough to create the desired effects. The full kit was powered by 2 high power 100w LED light sources, which considering there was still daylight showing through the branches on the photos, are pretty bright. 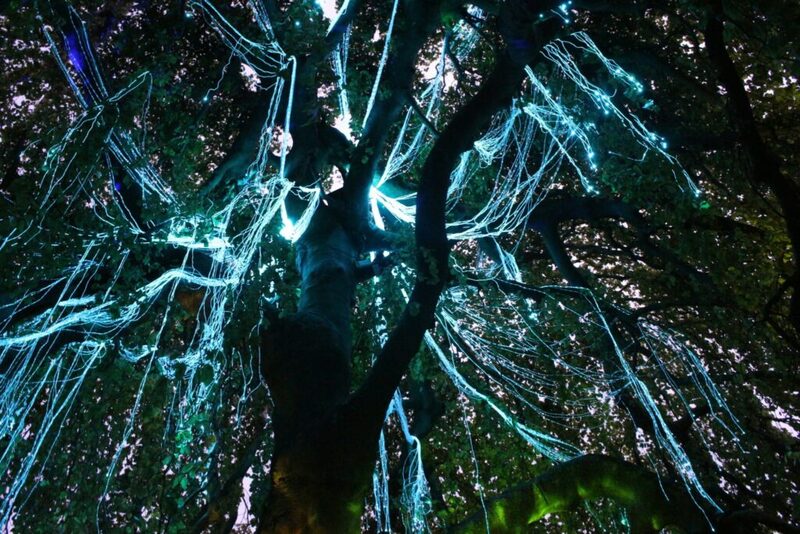 This is a small example of how custom fibre optics can help with your next project, whether its designing, installing or just supplying with a little advice, please don’t hesitate to get in touch, no matter how crazy the idea!